To treat children within our profile with Extraordinary experiences, gifted with unconditional kindness, love, compassion, dignity and respect, and gentleness. To “fill empty wishing wells, planting seeds for wishes to grow” by taking children, along with their senses that have not been stimulated or educated, on a magical adventure, to discover and explore different worlds, so vastly different from their own, so that they know that other worlds exist. To feed and nourish every one of their senses, from top to toe and everywhere in between. To escape from the harsh reality of life into a world of magnificence - a glimpse into a world of play; a chance to wish and perhaps give them hope, so that they see a different world – a world of possibilities. To give children the vital opportunity to see a world beyond their own so they can experience life and learn that the squatter camp, shack, rooms in backyards or bleak, violent, impoverished and unstimulating environments are not the borders of their world or their potential. To provide a vital educational stimulus of play, creativity, exploration and discovery. We create real life fairy tales that begin with Once Upon a Time – the beginning of the journey from their environments, journeying into our world of wonder, and ending with Happily Ever After as all fairy tales do. We take children on morning or half day outings (field trips) to child appropriate venues to stimulate and educate their senses, giving them a full body learning experience or we create a fun activity in their environment. An outing or an activity is called a Magical Moment and we create an "Extraordinary Day" – a day different from yesterday and different from tomorrow - an escape and distraction from the everyday harsh realities of life. We share love and laughter, fun and happiness, smiles and playfulness; seemingly ordinary to most, but certainly devoid and a luxury for these children. We “bling” their ordinary lives, adding “sparkles & sprinkles”, “glitz and glamour” to their dreary worlds. We feed and nourish children’s minds, bodies, tummies, hearts and spirits, planting positive seeds and investing in their Early Childhood Education (EDE), Early Childhood Learning (ECL), Early Childhood Education (ECD) and foundation phase years - when their minds and “wishing wells” are empty – and our fairies fill them up with so much more than they would ordinarily receive on an ordinary day, in an ordinary way, in an ordinary world. We are their “Extraordinary”. The purpose of a magical moment, while providing fun and positive intellectual and emotional experiences, exposes the children, within our criteria and profile, to these extra mural activities which are considered fundamental and mainstream in early childhood development. Each magical intervention facilitates opportunities for transformation and healing through unconditional kindness, love and compassion. Most of the children we reach out to come from severely financially disadvantaged and underprivileged backgrounds, many experiencing extreme trauma and difficulty through poverty, neglect and abuse or being orphaned or abandoned. We give children a chance to escape from the harsh world that they come from and live in – a chance to play, to laugh, to have fun, to indulge, to celebrate, to be children and for a magical moment, to forget. Since March 2004, the Fairy godmother and her Fairies have impacted the lives of well over 100 000 children and over 130 different beneficiaries in different communities across the city through enchanting excursions, tantalising treats and astonishing activities, focusing predominantly on children 2 to 7 years of age. Magical Moments, with its holistic approach, “feeds the mind, heart, body, tummy and spirit. We nourish the soul”. Many of the day care centres, crèches or places of safety are situated in the back rooms of someone’s home or in shacks or containers in squatter camps. We have engaged with toddlers living inside a prison, incarcerated with their mothers or who live on garbage dumping sites, children scratching through garbage bins in search of food, in some cases where the head of the household is a child. There are children living in the most dire circumstances and environments, left to fend for themselves, exposed to alcoholism, prostitution, sexual and drug abuse, neglect, ignorance, poverty, illiteracy, apathy and other social ills. These are children living with life-threatening diseases – forsaken. These children are also deserving of dreams and wishes. Just because you live in the gutter, doesn’t mean you shouldn’t look up at the stars. Most of our beneficiaries are not well known in the public domain and due to the broad profile and demographic foot print we reach out to children from different backgrounds and circumstances, most who ordinarily are not accessed by corporate companies, CSI and outreach programmes. 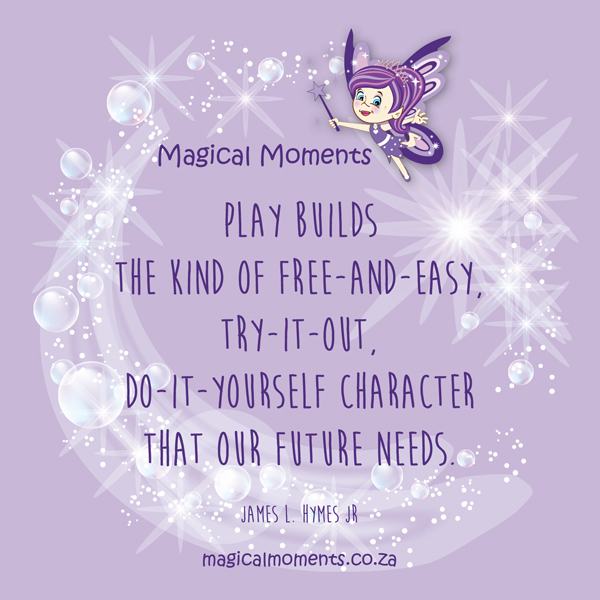 Magical Moments creates awareness about the children who “slip through the cracks” and go unnoticed, disadvantaged children playing in streets unable to go to crèche, or who live with elderly care givers, extended families and foster care parents. As they are not formally institutionalised (where charity usually goes) they do not receive the benefits of outreach initiatives and corporate and public philanthropy. Children deserving of some light, love and joy, playfulness and fun. Magical Moments engages in unknown places and areas, as that is where we can make the greatest impact and difference. A site visit of all beneficiaries is conducted to assess their needs and identify an appropriate treat, before they are nominated as a Magical Moments’ beneficiary. Magical Moments operates "below the radar" relying on "by word of mouth" donations, the majority being received from private individuals, friends and volunteers. The organisation is volunteer-driven with one full time volunteer, the Founder, Ilana Friedman. Donations go towards “fairy tales”, sensory adventures, to discover and explore experiences unknown, to transform limiting beliefs, fear and stereotypes., enriching their lives, with love and joy, and so much more. Copyright © 2019 Magical Moments. All Rights Reserved.